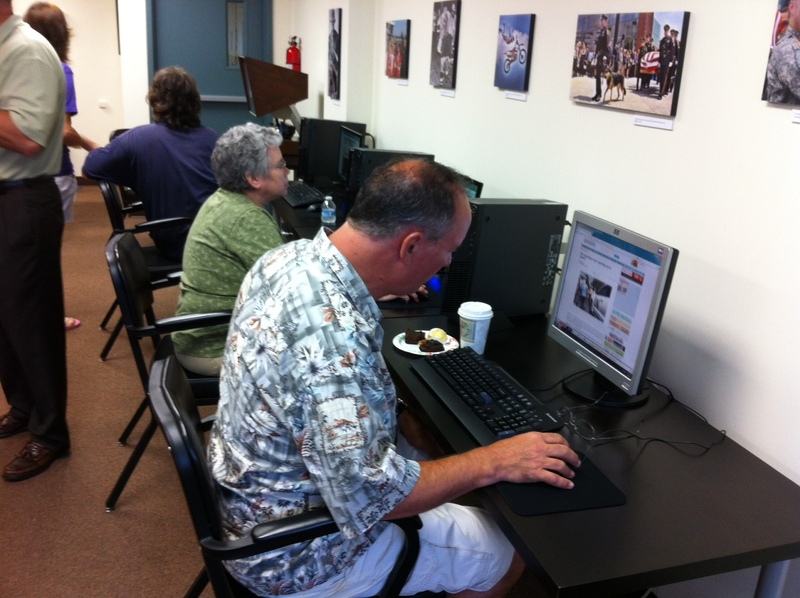 Visitors use computers available for public use at the Mercury’s new Community Media Lab. I was a guest speaker today at a ceremony in Pottstown, Pa., to celebrate the opening of the Community Media Lab of the Mercury, a Digital First news operation. The celebration was a joint opening with the new Pottstown Visitors Center across the street in the Merc’s original building. I have published a couple photos here, but others are in my DFM Engagement Tumblr started today. I also Storified tweets and photos about the opening celebration. Perhaps you’ve heard that newspapers are in trouble, or even that they are dying. I’m here to tell you today that the Mercury and Digital First Media have a bright future. The changes reflected in the Mercury’s new Community Media Lab are part of a transformation of our business that is delivering results and that will ensure a continuing role in Pottstown and the surrounding communities for the Merc and our journalists. It is true that most newspaper companies have been in severe decline the past few years, and that trend is continuing this year. But under the leadership of our CEO, John Paton, Journal Register Co. has dramatically changed directions the past two and a half years. Through our new management company, Digital First Media, we are now one of the biggest and most successful media companies in the United States. Our finances are improving. Our outlook is optimistic. And we are investing in engaging our communities in open newsroom projects like this one. Newspapers will be part of our product offerings for the foreseeable future. But the tumultuous past six years have proven that newspapers alone are not enough to support a community news operation in today’s marketplace. Digital First Media is building a new business model that recognizes how much more time people spend with digital media than with newspapers. First, we want to continue amplifying the voices of the community through the Merc’s Town Square blogger network. The Community Media Lab includes computers and wi-fi for community use. If you don’t have your own computer or want to learn more about how to use your computer, come on down and Diane Hoffman, our community engagement editor, will help you out. Diane will help you launch a blog about your neighborhood, your interests, your community group. She will make you part of our Town Square network, so you can make friends and learn from other bloggers. You will be invited to classes to help improve your blogging skills. Let’s be clear about one thing: We don’t expect bloggers to replace the professional journalists on the Merc staff, who play a vital role in community life. Private bloggers generally are not interested in playing the journalist’s watchdog role and most lack the skills to play that role. But digital technology has put the power of the printing press – and much more – in the hands of anyone with a smartphone, a tablet computer or a laptop. Whether newspapers and journalists like it or not, the community is now publishing its own stories. Many times, the stories the community is publishing are stories that traditional media has not covered or has undercovered. At the Merc and Digital First Media, we welcome the community to join us in telling your stories. We see community bloggers as collaborators, not competitors. If your neighborhood association, non-profit or community group is already producing a newsletter, in print or by email, Diane would be happy to show you how to reach a broader audience by turning that content into a blog and joining Town Square. Second, we welcome you to come to the Community Media Lab to study the history of your business, community group, religious group, school or family in the pages of the Merc. Our archives are here for you to browse and search for personal research, school projects or mere curiosity. The Merc has a long and proud history that includes two PulitzerPrizes (the smallest newspaper, according to Wikipedia, with two Pulitzers). The Merc’s archive is a community treasure, and we are pleased to share it with the community at no cost to you. 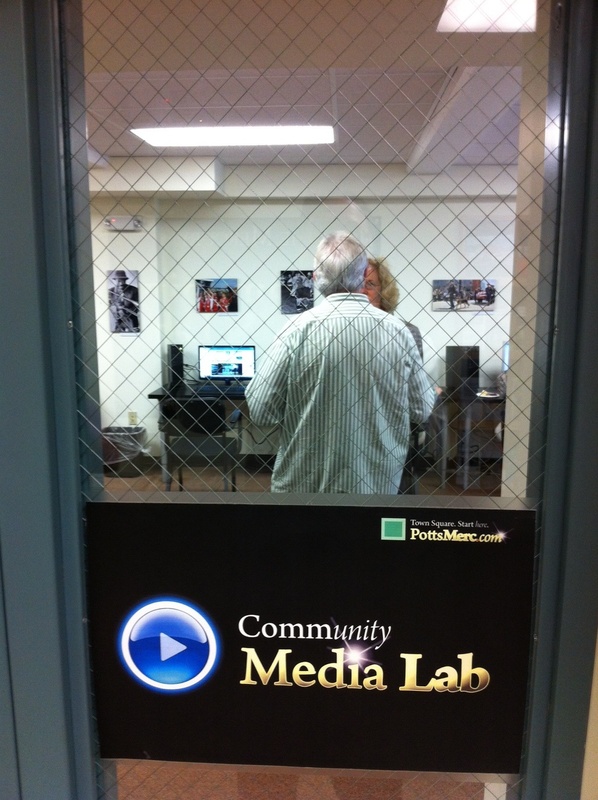 Third, the Community Media Lab does not offer just computers, but a gathering place. We invite community groups to hold meetings here. We will lead our own classes on the tools and techniques of blogging. We invite others to present other classes here as well. On my first visit to Pottstown, Sue Repko and Positively!Pottstown hosted a reception here even though the room was not yet finished. We want this to be a place of fun, fellowship and learning. As important as digital communication is to our future, we know that a strong community grows from people interacting face to face, elbow to elbow, and we are pleased to provide a place for such gatherings. Many of you know about the Merc’s commitment to making Pottstown and the surrounding communities better places to live. You helped in the Mother’s Day cleanup or you contributed food and laundry detergent to restock the community food pantries, both efforts led by the Merc and its Town Square bloggers. I wish the Merc’s Editor, Nancy March, could be here for this opening. She has delighted in keeping me posted every step of the way as she and Diane and their colleagues have worked on this project. Unfortunately, the best time for the opening happened to coincide with a vacation Nancy had already planned. But I assure you that Nancy is deeply committed to this project and you will see a lot of her at the Community Media Lab. The Merc, Digital First Media and the community could not ask for a better leader here. I want to recognize the work of a lot of other people who have helped make today’s opening possible: Diane Hoffman and Ed Condra, who are speaking here today; Bob Morris, who handled the remodeling; online editor Eileen Faust, who is involved with all of our engagement efforts; and Sheldon Scott of our IT department, who made sure we were outfitted with computers. We also need to thank our corporate leaders, who have been relentless champions of the community engagement approach: CEO John Paton, whom I’ve already mentioned; Digital First’s Editor-in-Chief, Jim Brady, and Vice President Jon Cooper. Their leadership resulted in this commitment to Pottstown that we are recognizing and opening today. This is an exciting day for Digital First Media and I hope it is for the community of Pottstown as well. I am going to be traveling next week to visit other community newsroom projects in Willoughby, Ohio, and in the Twin Cities. We believe this is the path to prosperity for journalism and we believe that prosperity will ensure continued service to Pottstown and the other communities we serve. 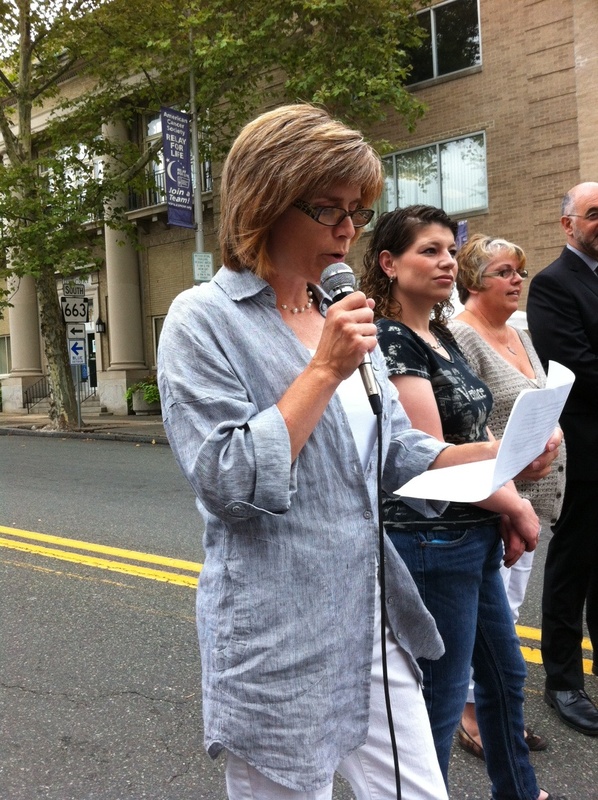 Sue Repko speaks at ribbon-joining ceremony in Hanover Street in downtown Pottstown. First, I’d like to say a few words on behalf of Mayor Bonnie Heath. She is attending the Pennsylvania State Mayors Association Conference and couldn’t be here today and asked me to welcome all of you to Pottstown for the opening of the new Visitors’ Center and the Mercury’s Media Lab. The collaboration involved in putting together not only today’s event, but so many other activities reflects a new, positive spirit that is making tangible changes. From the massive food pantry challenge organized and spurred on by The Mercury and local bloggers, to the recent Buy Local campaign in the schools, to the huge sidewalk sale set for tomorrow, businesses, organizations, and residents of Pottstown, as well as throughout the entire region, are working together to make Pottstown a better place. Thank you all for your efforts. Now, I’d like to switch hats and become Sue Repko again. I’m here as one of the first Town Square bloggers with my Positively!Pottstown blog, and as a member of the Pottstown Downtown Improvement District Authority board, also known as PDIDA. When I was asked to say a few words about this ribbon-joining ceremony, I was caught off-guard: What am I supposed to say about a ribbon joining as opposed to a ribbon-cutting? But once I had the image in my head of a big ribbon running across the street between The Mercury and the PDIDA office and Visitors’ Center, it started to become clear. Both of these new spaces are milestones for Pottstown as it continually tries to shift its fortunes, to bring back jobs and economic activity, which give us a better shot at bringing back homeowners and visitors, people who ARE doing okay in this economy and might choose to spend their dollars in a revitalized Pottstown – which IS the Pottstown of the past, a place to which folks would ride their horse and carriage for a day of shopping, or to sit for a photographer to get their portrait taken, or to have a special meal at a hotel. Pottstown was the regional hub for commercial activity long before the 1950s. The Visitors’ Center, now with its historic photos, and as the home of our Downtown District Authority, is a way of re-asserting the importance of our history and the potential to tap that history for a new, commercial strength. The inspiration for this, for making the Visitors’ Center welcoming and for reviving PDIDA and bringing merchants and the larger community together has come from Sheila Dugan, first a volunteer and now a part-time Main Street Manager and also, along with her husband, Gene, a business owner. In just about a year, enormous changes have occurred due to her tireless efforts, problem-solving, and non-stop communication with merchants, the Borough administration, and with the public. Please give her a round of applause. And now if we follow this ribbon across the street, we come to The Mercury building, housing a newspaper that is also indelibly linked to the history of Pottstown. It has embraced new technologies and new ways of communicating with its readers, and has also facilitated communication among those readers. Through its Town Square blogging community, it has encouraged new voices to join in civic life. Technology and the internet have enabled new voices to be heard in communities large and small throughout the world. Indeed, it has literally enabled revolutions. Word travels faster and reaches more people. But there is also a need for face-to-face interaction, for learning from one another, and for being able to link to our past. Being able to access Mercury archives in a location in addition to the library and having a physical space for these interactions, reminds us that we’re human, that there are people right here in our community who can help and support us, and who may need our help in return. So, what does this have to do with this ribbon? Communication is at the heart of a healthy, functioning community and democracy. Effective, positive communication, quality products and service are at the heart of any successful business and at the heart of any successful business community. I ask all of you here today to think of this ribbon as not only joining PDIDA and The Mercury, but as a thread that runs from building to building, up and down all our streets, a thread that a visitor to either of these new spaces might pull along back home, wherever they’re from, a thread that holds a new positive image of Pottstown, of its past and of its present, a thread that a potential new business owner might firmly stitch into his or her vision of the future – being in the midst of people and a place that takes pride in its past but will not be deterred from creating a bright new future for itself. To me that vision includes drawing on our past, our connections to the river, the railroads, pies and shoe polish, to the making of useful things, to creativity and being at the leading edge, with our educational institutions now as our anchors. This ribbon runs not just from here to there (PDIDA to the Mercury), but out to the world, if we let it. I hope you enjoy the rest of the day and be sure to come to the sidewalk sale tomorrow. There’s plenty to do and see and buy. Bring your friends… and don’t forget to tweet and tell everyone on Facebook and on the blogs and in Sound Off what we’ve got going on here in this fine town! Thank you. Outstanding! Thanks for your remarks, your involvement and your confidence in us.